Dedicated April 10, 1970, Barton Hall is named for Philip Shaw Barton, the first director of the Thompson School of Applied Science. A 1928 graduate of the animal science program at the University of New Hampshire, he received a master’s of education in 1938. The following year, he helped establish a two-year practical agricultural curriculum at the College. Barton also helped to found the Thompson School of Agriculture in 1953 and later assisted in its 1966 evolution to the Thompson School of Applied Science before retiring from the University in 1969. Designed by Edward Benton Miles and built by The Maxam Co., planning for Barton Hall began in 1963, with construction completed in 1969. The building contained a modern dairy and ice cream manufacturing plant, as well as classroom and demonstration spaces, laboratories, and administrative offices. Established in the early 1980s, the Browne Center offers university courses in outdoor education as well as workshops, training, and professional development exercises for all ages. 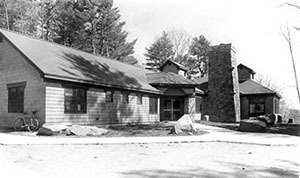 Located five miles from the University of New Hampshire campus in Durham, the land on which the Center is located was donated by Evelyn Browne (1915-1994), a UNH alumna and former professor. Beginning as a physical education instructor in 1943, Browne piloted the first outdoor education course in 1955 and was committed to the outdoor education curriculum until her retirement as professor emeritus in 1981. Awarded a master’s in history in 1960, she was responsible for cataloging the Adams Family Papers for Dimond Library. Browne was also the founder and first president of the Great Bay Estuarine System Conservation Trust. 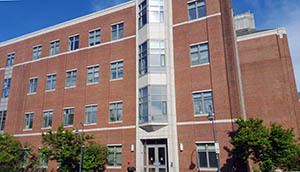 Constructed in 1996 and dedicated October 10, 1997, the Chase Ocean Engineering Building is named in honor of Jere A. Chase. A 1936 graduate with a degree in mathematics, Chase began his career at the University of New Hampshire as a ski coach and student administration counselor. His tenure at UNH was marked by diversity of office: at various times, Chase was assistant to the President, Acting President, Executive Vice President, Interim President, Interim Director of Alumni Affairs, and Interim Athletic Director. He played a key role in establishing New Hampshire’s public TV Channel 11, the construction of the Memorial Union Building, the creation of the University’s Manchester campus, developing the New England Center, and establishing the University System of New Hampshire, of which he was a trustee for eight years. Chase was also instrumental in establishing the Marine Program at the University of New Hampshire and the designation as a sea grant institution. He received an honorary Doctor of Laws degree in 1969 and the Alumni Association’s Pettee Medal in 1992. Fun Fact: The University of New Hampshire’s first research vessel, the R/V Jere Chase, has the same namesake as the Chase Ocean Engineering Building. Cole Hall was designed by Banwell Architects and, in 1990, was named for Stacey Ward Cole (1921-2014), a 1941 graduate of the Thompson School of Applied Science. Cole and his wife Mildred owned and operated Red Crow Farm and were very active in the agricultural sphere. During his life, Cole served as a member of the Board of Directors and President of the New Hampshire Farm Bureau, as well as the executive director of the New Hampshire Petroleum Council and senior agricultural advisor to the American Petroleum Institute. He was also the recipient of a number of prestigious agricultural awards, including the Agricultural Experiment Station Centennial Award, a life membership in the N.H. Farm Bureau Federation, the Andrew L. Felker Award, and the Award for Distinguished and Meritorious Service to American Agriculture. In addition to serving as a New Hampshire State Representative and political advisor, Cole was active in his alma mater, receiving the University of New Hampshire Meritorious Service Award in 1958 and serving as a USNH trustee from 1974 to 1986. In 1986, the Thompson School of Applied Science established the Stacey W. Cole Endowment Scholarship in his honor. Cole was also a talented writer, regularly featured in the Union Leader and the author of New Hampshire, A Lyrical Landscape. Built in 1893 under the supervision of Mr. Randlett of the firm Daw and Randlett, Conant Hall was one of the original five buildings to be constructed when New Hampshire College moved from Hanover to Durham that year. 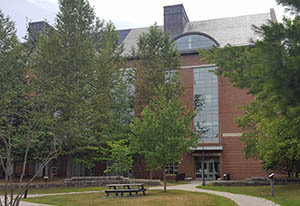 The building is named for John Conant (1790-1877), a farmer who had donated $70,000 for the construction of buildings and scholarships for agricultural students at New Hampshire College. 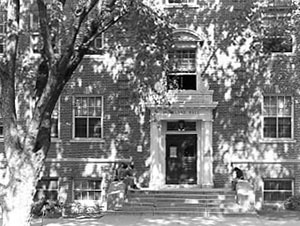 Conant Hall was rededicated May 9, 1986 after extensive renovations to better house the Psychology department. On October 29, 1999, the building was designated a National Historic Chemical Landmark by the American Chemical Society for Charles James’ work on the separation of rare earth elements, completed in one of Conant’s laboratories. 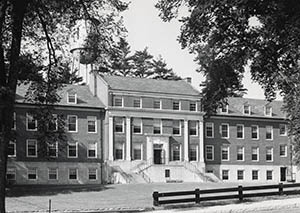 Fun Fact: There was also a Conant Hall on Dartmouth’s Campus built as a dining hall and dorm for New Hampshire College’s agricultural school. The building was purchased by Dartmouth and renamed Hallgarten Hall. Only the rear portion survives as Dartmouth’s electro-acoustic music studio. Craft Cottage was originally part of General Hoyt’s property, then left to his wife for use during her lifetime. 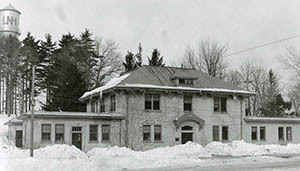 The house was later rented by Albert H. Wood, until roughly 1897, when the property, acting as a bachelor pad of sorts, became known as “The Orphanage.” New Hampshire College rented the property in 1912 to lease as a residence until the Home Economics department began its occupation in 1918. When that department moved to the Elizabeth DeMeritt House in 1930, Craft Cottage transitioned to a nursery school until it was moved next to Elizabeth DeMeritt House in 1932 to clear the area in preparation for Scott Hall’s construction. 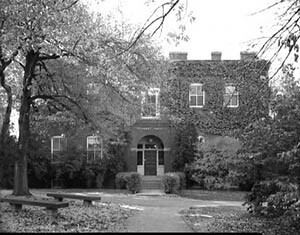 The original DeMeritt Hall was constructed in 1914 and named for Albert DeMeritt, a representative from Durham in the state legislature who was instrumental in securing state funding for the building. Over time, the building served as the home of the physics department, the mechanical and electrical engineering departments, the former School of Architecture, and a temporary dormitory. The original structure was demolished in July 2007 and was replaced by the new DeMeritt Hall, designed by Architerra, Inc. and Rist-Frost-Shumway and built by Harvey Construction, completed in 2008. Dimond Library is named for Ezekiel Dimond, the first full-time professor at the New Hampshire College of Agriculture and Mechanic Arts. He began his career at the Hanover campus in 1868, bringing with him seven boxes of possessions, which would comprise the entirety of the College’s physical property at the time. A business and farm manager, architect, construction supervisor, and legislative lobbyist, Dimond was instrumental in the growth of the College from its initial enrollment of ten students. He retired due to health concerns with epilepsy in 1875 and his death the following year resulted from a brain tumor. Dimond Library was constructed in 1958 to replace Hamilton-Smith Hall as the campus library. Though not formally named until 1967, it has been known as Dimond Library since 1963. An addition was built in 1969 to expand square footage from 165,000 to 207,000. A subsequent addition and renovations were undertaken in 1997 and completed in 1998. Dedicated in 2004, Gregg Hall is named for U.S. Senator Judd Gregg, whose efforts on behalf of the University of New Hampshire helped secure more than $266 million in federal funding for university research throughout his career. The construction of the building was funded primarily through federal and state grants and private donations. Gregg Hall became operational as an environmental technology building in 2001 and is home to NOAA-UNH Cooperative Institute for Coastal and Estuarine Environmental Technology (CICEET), the Cooperative Institute for New England Mariculture and Fisheries (CINEMAR), the Environmental Research Group, the Office of Intellectual Property Management, the N.H. Industrial Research Center, NOAA’s Northeast Coastal Ocean Program, the Hubbard Genome Center, and the NASA/NOAA Center for Technology Commercialization. Dedicated at commencement on June 3, 1907, Hamilton-Smith Hall is named in honor of Hamilton B. Smith (1840-1900), a mining engineer and businessman who had donated generously to New Hampshire College. Upon his death, Smith had bequeathed $10,000 for the construction of a much-needed new library building on campus. 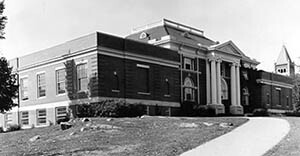 His contribution was supplemented by a Carnegie grant to result in a structure that served as both the university library and the Durham Public Library from 1907-1958. 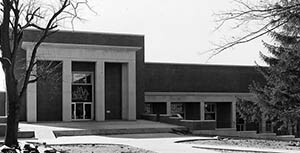 When the state legislature authorized a new library building in 1955, it also authorized funds to remodel the interior and exterior of Hamilton-Smith into classroom and office space. The 1959 renovation was designed by Koehler and Isaak and contracted by Harvey Construction Company. 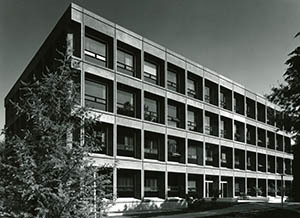 The building was further expanded in 1965-1966 to house the English and philosophy departments in addition to those of history, government, and sociology. The most recent renovations to Hamilton-Smith Hall were undertaken in 2016. Constructed in 1893 and formerly known as the “Shops Building,” Hewitt Hall was named for Charles Elbert Hewitt (1869-1934) in 1942. Hewitt was the first student to enroll in the electrical engineering course at New Hampshire College, graduating in 1893 and going on to obtain a master’s at Cornell. In 1908, he became the head of the electrical engineering department and later the first dean of the engineering division at the University. He later served as an expert adviser for the War Department and a specialist with the American Council on Education. Hewitt Hall was renovated three times between its construction and 1947, when the U-shaped building was renovated once more and “filled in.” Another major renovation took place in the early 1990s with the “New Hewitt Hall” reopening in March 1994. Dedicated April 30, 1977, the Horton Social Science Center is named for Mildred McAfee Horton, who served on the Board of Trustees from 1963-1974 and as its chairman during 1972-1973. The building was designed by Skidmore, Owings &Merrill of New York City and built by Harvey Construction Company from 1967-1968. It opened for use during the 1968-1969 academic year and housed the history, political science, sociology, and anthropology departments, as well as offices for the Graduate School and the Research Department. The first building on campus designed by architect Eric T. Huddleston (1888-1977), Huddleston Hall was completed in 1919 as a dining hall and named The Commons. The building was renamed for its designer on October 12, 1963. Huddleston arrived at New Hampshire College in 1914 and would serve as the supervising campus architect until his retirement from that post in 1946. He had previously expanded the Department of Drawing to create the first college-level architectural program in northern New England and would continue to serve on the college faculty until 1958. Huddleston was also founder and first president of the New Hampshire Society of Architects and became a Fellow of the American Institute of Architects in 1953. Though no longer a dining hall, Huddleston Hall now serves as classroom and office space, as well as having a large ballroom for campus functions. Dedicated May 30, 1970, the Jackson Estuarine Lab is named for Professor “Prof” C. Floyd Jackson. Jackson joined the New Hampshire College faculty in 1908 as an assistant entomologist and served as a Professor of Zoology from 1910-1946 and Dean of the College of Liberal Arts from 1930-1939. He is responsible for the marine emphasis of the zoology classes and led summer courses on the Isles of Shoals, where he established the Isles of Shoals Marine Laboratory in 1928. Jackson served as lab director there until offshore operations were curtailed during the Second World War. His other titles included president of the New Hampshire Academy of Science and Fellow of the American Society for the Advancement of Science. Jackson passed away on January 28, 1970, just prior to the completion of the lab named for him. Located at Adams Point, Jackson Estuarine Lab was designed by Pierce and Luykx and built using funding from the National Science Foundation and the New England Regional Commission. It serves marine-oriented faculty and students from the Departments of Biochemistry, Botany, Geology, Microbiology, and Zoology. James Hall is named for Charles James (1880-1928), a chemistry instructor at New Hampshire College. A 1904 graduate of the London Institute of Chemistry, James came to New Hampshire College in 1906 and was promoted to a professorship and department chair in 1912. Known as “King James” to his students, he specialized in the study of rare earths and published over 60 papers in the Journal of the American Chemical Society, also producing Encyclopedia Britannica’s entry on the topic. He received the Ramsay silver medal in 1901 and the Nichols medal in 1911 and was awarded an honorary Doctor of Laws from the University of New Hampshire in 1928. 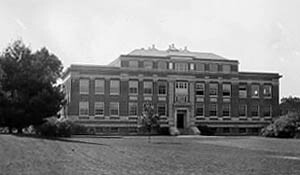 Designed by Eric T. Huddleston, the building was dedicated on November 9, 1929 and housed the agricultural and biological chemistry departments and the Experiment Station. In 2008, renovations were undertaken through the KEEP-NH program in an effort to seek LEED (Leadership in Energy and Environmental Design) certification. These renovations were completed by EYP Architecture and Shawmut Construction. Kendall Hall is named in honor of John Chester Kendall (1877-1941). A 1902 graduate of the dairy husbandry program at New Hampshire College, he returned to his alma mater in 1910 to become director of the Agricultural Experiment Station, serving in this capacity until 1939. In 1911, he also became director of the Agricultural Extension Service, a position he would hold until his death. During that time, Kendall helped New Hampshire become the first state to complete the county extension program of county agricultural agents, home demonstration agents, and 4-H Club agents. Kendall Hall was designed by Frank Grad & Sons and constructed by Davison Construction Company, Inc. 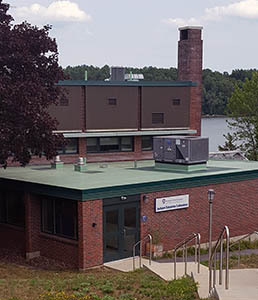 It was funded through the New Hampshire Department of Agriculture for the Veterinary Diagnostic Laboratory, Title II Higher Education Facilities Act of the Federal Government, and state and departmental funds and originally housed the animal sciences department. The first inhabitants of the Kingman Farmland were Joseph Hicks and his wife, Sarah Davis, who settled there prior to 1750. They erected a small building and a barn on the property, the former destroyed by fire in 1941. In 1818, John Kingman married Lydia Hicks Drew, Joseph Hicks’ great-granddaughter and their son, Charles Henry Kingman, would be the next person to live on the land. The land was passed down through the generations to Lotta S. Kingman and her husband, Thomas Jefferson Laton, an engineering professor at the University of New Hampshire. In 1965, Lotta sold 202 acres of farmland and woods to the University. 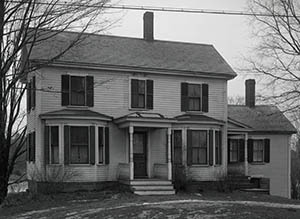 After her death in 1972, UNH purchased the farmhouse and the rest of the farmland (with the exception of 18 acres) from Lotta's daughter Dorothy and her husband, Carl Wentworth. The property is now used for educational and recreational purposes, especially for field experience for the University's Department of Natural Resources and the Environment. Fun Fact: The Kingman farmhouse has the distinction of being the second house in Madbury, NH to have a TV in the late 1940s-1950s. Kingsbury Hall is named for Professor Albert Kingsbury (1863-1943), the University’s first mechanical engineering professor. Kingsbury was offered employment at the New Hampshire College of Agriculture and the Mechanic Arts in Hanover shortly after graduating from Sibley College at Cornell University in 1889. After a brief stint in which he left the College to assist in the establishment of a machine shop to manufacture brickmaking machines, he returned as a full professor of mechanical engineering in 1891. In 1898, while teaching at New Hampshire College, Kingsbury invented the thrust bearing. The following year, he left Durham to work for Worcester Polytechnic Institute. He later founded Kingsbury Machine Works, where he produced the thrust bearing he had invented while in Durham. An expert in the field of lubrication, he was also an accomplished linguist and interested in arts, letters, and history. In 1935, he received an honorary Doctor of Science from UNH. 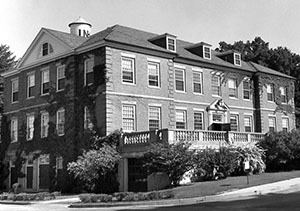 Construction of Kingsbury Hall was approved in 1947 and began in the winter of 1948 to be completed in the spring of 1950. The cornerstone laying ceremony took place on November 11, 1949 and the building was dedicated October 14, 1950. In 2004, UNH began major renovations and expansion of Kingsbury Hall through the KEEP-NH initiative, totaling 208,000 gross square feet. 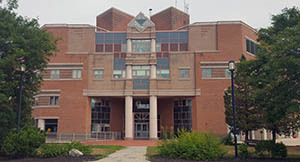 Built in 1967, McConnell Hall is named for John W. McConnell (1907-1997), who served as the president of the University of New Hampshire from 1963-1971. During that time, enrollment numbers nearly doubled and 150 members were added to the faculty. 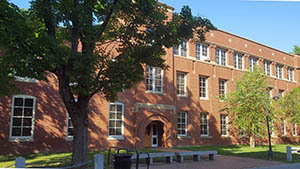 In addition, McConnell’s administration was responsible for undertaking a $45 million construction program, establishing the Merrimack Valley Branch of UNH in Manchester, founding the Whittemore School of Business and Economics and the School of Health Studies, and creating the New England Center. McConnell was also instrumental in establishing the joint faculty-student-staff University Senate and the positions of student trustees on the Board of Trustees, as well as programs for minority students and employees. He received the Alumni Association’s Charles Holmes Pettee Medal in 1995. In 1902, the New Hampshire state legislature appropriated funds to build a new agricultural and horticultural building on the New Hampshire College campus. Construction was undertaken by Walter H. Sargent and the building was dedicated October 28, 1903, though the third floor would not be completed until 1914 due to insufficient funding. Morrill Hall is named for Justin Smith Morrill (1810-1898), a U.S. Senator from Vermont and father of the Morrill Act that established land grant colleges and universities. Morrill was also one of the founders of the Republican Party and a staunch abolitionist. He was known for his fiscal prowess as well as his role in helping to establish the Library of Congress and ensuring the completion of the Washington Monument. 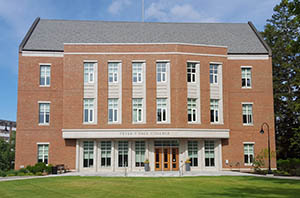 Morse Hall is named for Richard A. Morse, a member of the class of 1951, a longstanding member of the Board of Trustees, and a founding director of the UNH Foundation. His term as a trustee spanned from 1971-1985 during which time he was the board’s chairperson for eight years. Morse was also interim Chancellor of the University System of New Hampshire from 1982-1983. 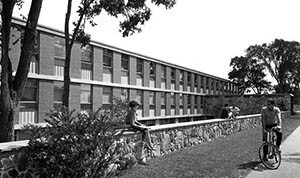 The proposal for Morse Hall was presented to Senator Warren B. Rudman in 1982 and a $15 million federal grant was awarded for its construction the following year. Groundbreaking began in 1984 and the building was completed and occupied in 1986. It was dedicated to Richard A. Morse on August 19, 1992. Named for Charles Sumner Murkland (1856-1926), the first president of New Hampshire College after its establishment in Durham, Murkland Hall was designed by Professor Eric T. Huddleston in 1927. Once a pastor in Manchester, New Hampshire, Murkland came to Durham in 1893 and retained the post of president until his resignation in 1903. Under his administration, enrollment grew from 27 to 127 students and faculty members more than doubled. It was during this time that the two year course in agriculture and the biology summer school were established and the College of Liberal Arts was strengthened. Later in life, Murkland served as a chaplain with the YMCA service in Europe during World War I.
Huddleston incorporated the architectural features of both DeMerrit and Morrill Halls in his designs for Murkland Hall to create an aesthetically harmonious quadrangle at the heart of campus. The building was originally planned as additional book space for the library, as well as classroom space. It was renovated and restored in 2002 as part of the Knowledge Economy Education Plan (KEEP-NH). Murkland now houses the Department of Languages, Literatures, and Cultures, the office of the Dean of the College of Liberal Arts, and Richards Auditorium. One of the first buildings constructed after the move from Hanover to Durham, Nesmith was built in 1893 and named for Judge George W. Nesmith, a trustee on the boards of both Dartmouth and New Hampshire State College. It was originally built to house the Agricultural Experiment Station. 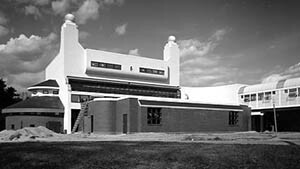 Based on the design of William Butterfield, the completed structure was noted for its eccentric architecture, but remodeled first in 1932 then again in 1938-1939 under the direction of architect and Professor Eric Huddleston to expand the building and provide a cleaner exterior image. Significant interior renovation was undertaken during the 1960s. 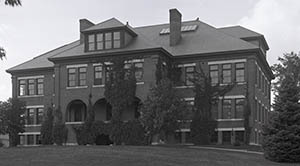 Nesmith was decommissioned as a laboratory after the completion of Rudman Hall and was used, for a time, as swing space during renovations on Dimond Library and Pettee Hall. Originally an armory and a gymnasium, New Hampshire Hall was constructed in 1906 using student contributions and funds donated by Lucius Tuttle, the former president of the Boston & Maine Railroad. Tuttle’s donation was made in gratitude for the assistance offered by students at New Hampshire College when a train overturned on campus in 1905. The state legislature of 1905 voted to erect the building to house the Departments of Physical Education and Military Science, as well as an auditorium. The building was remodeled in the 1940s to use for the women’s physical education department, the Newman Club, and for Christian work, dramatic productions, and student social activities. 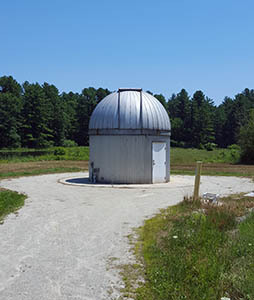 The UNH Observatory was constructed in February through April 1985, using a $25,000 Elliott Fund Grant. It was originally located on the west edge of campus, past the Field House, but was moved to a new darker site on Horticultural Farm Road during the summer of 2004. It houses a 14 inch telescope that is used primarily for educational, rather than research, purposes by UNH astronomy classes and local astronomy clubs. Dedicated October 29, 1966, Parsons Hall is named for Charles Lathrop Parsons (1867-1954), a scientist and professor at New Hampshire College. Parsons joined the staff at New Hampshire College as an assistant chemist in the Experiment Station after receiving his bachelor’s degree from Cornell. He was appointed as instructor of chemistry in 1889 and was subsequently promoted to associate professor a year later and professor in 1891. 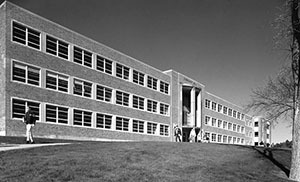 Parsons was responsible for planning the original Durham campus chemistry facilities in Conant Hall and supervised the departmental move from Hanover. In 1905, he became the second American scientist to win the Nichols Medal for his research on beryllium. He was named department head in 1907 in which capacity he served until 1912, when he left New Hampshire College to become the chief mineral chemist in the Federal Bureau of Mines. Parson was a long-serving secretary of the American Chemical Society and was honored for his achievements with the Priestly Medal in 1932, the A.S.C. gold medal in 1946, honorary degrees from the Universities of New Hampshire, Maine, and Pittsburgh, and was an officer in French Legion. Parsons Hall was designed by Alonzo J. Harriman Associates and built by Harvey Construction Company to house the Department of Chemistry and a chemistry branch library. 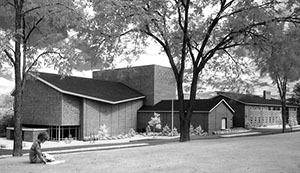 Construction began in 1965 with the East and West wings and was completed in 1968 with the addition of the lecture hall and classroom wings, including Iddles Auditorium. Solar heating was added in the 1970s but is no longer in use, though the solar panels remain on the roof. Paul Creative Arts Center was designed by Shepley, Bulfinch, Richardson, and Abbott and contracted by Harvey Construction Company. 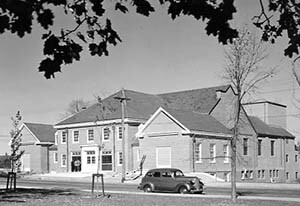 Construction of a building to house music, speech, drama, and the arts had been authorized by the New Hampshire General Court in 1957 and funded through legislative bonds and private donations. 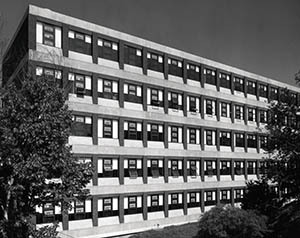 Construction was completed in 1960 and the building was dedicated October 13-15, 1960. It is named for Isabel and Harriet A. Paul, the former of whom had bequeathed $800,000 to the University in 1952, the largest gift to that point in the institution’s history. Although Isabel Paul had no personal ties to UNH, she was extremely cultured, well-traveled, and generous with her family fortune, providing a number of students from Newfields, NH with the means to obtain a college education. The Peter T. Paul College was designed by Goody Clancy and built by PC Construction, with groundbreaking on May 3, 2011. Dedicated April 12, 2013, the college is named for Peter T. Paul, a 1967 graduate of the University’s business administration program. Based in California, he is president of Headlands Asset Management, West Biofuels and Peter Paul Wines, and Chairman of the Board of the Headlands Foundation, a non-profit he founded in 1996. Paul’s history of generosity to his alma mater include a 2001 donation of $10 million to establish a chairs in space science and in developmental psychology, and his 2008 donation of $25 million to found a new business school in his name. The same year, he received the first Annual Achievement in Business Award from the Whittemore School of Business and Economics and, in 2009, he received the Pettee Medal from the University of New Hampshire Alumni Association. With construction beginning late in 1937 and completed in 1938, the original Pettee Hall was designed by Professor Eric Huddleston to house the home economics, agricultural engineering, and military science departments. The building is named for Dean Charles H. Pettee, who served UNH and New Hampshire College for 62 years as a professor, dean, and three-time interim president. He helped design the layout of the college after transferal to Durham and developed the tradition of ice hockey at UNH. Extensive exterior renovation was undertaken by the architectural firm of JSA, Inc. beginning in 1998. 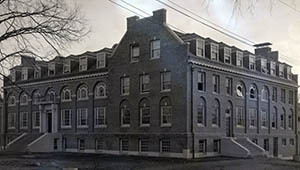 Rededicated March 2, 2001, Pettee Hall reopened to house the Family Studies and Social Work Departments and the New Hampshire Institute for Health Policy and Practice. 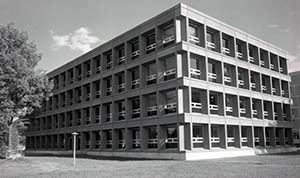 The Poultry Lab Building was constructed in 1962 for use by the College of Life Sciences and Agriculture. Dedicated December 10, 1949, Putnam Hall is named for George Martin Putnam, an honorary alumnus to whom UNH awarded a Master of Arts in 1929. He served as President of New Hampshire Farm Bureau beginning in 1917 and Director of the American Farm Bureau Federation beginning in 1922. For his service and dedication to the agricultural industry of New Hampshire, Putnam was awarded the first American Farm Bureau medal and the Golden Sheaf emblem of the Grange for 50 years of continuous membership in an organization in which he had previously served as master of his local Grange. Putnam Hall was constructed to house administrative offices for the applied farming course, laboratory work, and livestock judging. 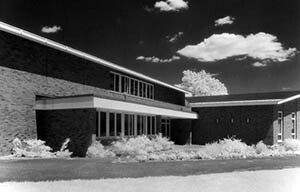 The Ritzman Animal Nutrition Lab was constructed in 1959 to replace the original laboratory in the creamery, which had been destroyed by fire in 1956. Dedicated in 1960, it is named for Ernest G. Ritzman (1875-1955), a research professor of animal husbandry who piloted the metabolism research program in 1918. Ritzman came to New Hampshire as an animal husbandman in 1915 after serving in the Spanish American War. His original scope of research continued that of Alexander Graham Bell, who had bequeathed New Hampshire a flock of sheep in the hopes of cross-breeding them to produce twins. Ritzman later delved into metabolic studies with cows after being assigned a “war baby” investigative project on the topic. He is credited with building the original nutrition laboratory into a significant research unit. He was granted an honorary Master of Science degree by UNH in 1928 and became a research assistant at the Carnegie Institution of Washington in 1934, retiring in 1945. Dedicated April 30, 1996, Rudman Hall is named for Senator Warren B. Rudman, who helped the University attain financial support for the construction of a biological sciences building. In 1992, he secured an appropriation of $15 million in federal funding, which was matched by the state under Governor Judd Gregg. Ever the UNH supporter, Rudman also helped secure funding for Morse Hall. The Smith Equine Center is named for Lou and Lutza Smith, who were active in the horse-racing industry in New Hampshire. Lou was the founder, owner, and principal operator of Rockingham Park Race Track in Salem. He played a vital role in the founding of the Thoroughbred Racing Association and was a great supporter of protecting the welfare of jockeys in the foundation of the Horsemen’s Benevolent and Protective Association. Known for their philanthropy throughout their lives, Lutza established the Lou and Lutza Smith Charitable Foundation in 1971 to grant money to charitable causes within the state. Smith Equine Center was built in 1980 and includes barns, classroom and laboratory space, offices, a conference center, treatment rooms, and a run-in shed for UNH horses. Dedicated May 6, 1960, the Spaulding Life Sciences Center was named for former governor Huntley Nowell Spaulding (1869-1955); his wife, Harriet Mason Spaulding (1876-1954); and his sister, Marion Spaulding Potter (1879-1957). 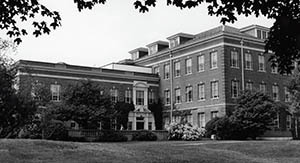 Construction on the building began in 1958 with funds authorized the previous year by the New Hampshire General Court and supplemented by a grant from the U.S. Public Health Service. The building itself spans the College Brook, consequently presenting three levels from the ravine and two from DeMeritt Road. Taylor Hall stands on the former site of the barn where New Hampshire College held its first commencement exercises on the Durham campus in 1892. There is a plaque with the class members’ names outside of the building, placed by Edward Munroe Stone of the class of 1892, to commemorate the occasion. The building once held the university’s dairy processing equipment, but underwent a $53,000 renovation program completed in 1964 to house the offices of the College of Agriculture and the Cooperative Extension Service. Taylor Hall is named for Frederick W. Taylor, who arrived at New Hampshire College in 1903 as a Professor of Agronomy and the Agronomist for the Experiment Station. He was subsequently promoted to Dean of the College of Agriculture and Director of the Commercial Departments of the College of Agriculture. During his tenure at New Hampshire College and the University of New Hampshire, Taylor saw faculty increase from 20 to 165 members and student enrollment surge from 128 to 1707 students. A faculty profile from the February 1948 New Hampshire Alumnus cites Taylor as the “oldest member of the faculty” in terms of years of service to the University. Fun Fact: Frederick Taylor also achieved distinction as the owner of Durham’s first four-cylinder car, a “model S” Ford. Woodman Horticulture Farm earns its name from its original owner, Moses G. Woodman. 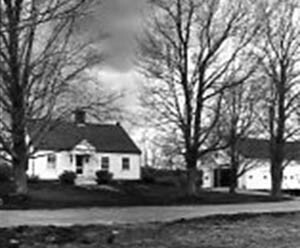 The New Hampshire College of Agriculture and the Mechanic Arts had been leasing the rights to the orchards on the property since as early as 1912 and in 1917, the College purchased the farm from Daniel Chesley, the executor of Woodman's will, for "one dollar and other valuable considerations." 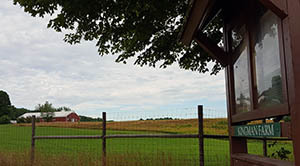 Woodman Horticulture Farm is now used as a facility for the New Hampshire Agricultural Experiment Station, for equine and natural resource education, and as an outreach center for UNH Cooperative Extension. Zais Hall is named for Melvin Zais, a 1937 graduate of the University of New Hampshire. Zais began his military service as an army reserve second lieutenant. He completed several active duty tours and volunteered for the original army paratroop battalion, the 501st Parachute Infantry Battalion. Zais served overseas tours during World War II, Korea, and Vietnam. He was selected Brigadier General in 1964 and promoted to General in 1973. Awarded an honorary Doctor of Science from UNH in 1971, he was also a graduate of the Command and General Staff College, the Armed Forces Staff College, the National War College, and Harvard Business School’s Advanced Management Program. His military decorations include five Distinguished Service Medals, two Silver Stars, four Legions of Merit, two Distinguished Flying Crosses, the Bronze Star Medal, the Joint Service Commendation Medal, two Army Commendation Medals, and numerous foreign awards and honors. When Zais Hall was dedicated on October 14, 1978, Zais was the highest ranking UNH alumnus in the Armed Forces. The building now houses both Army and Air Force ROTC programs.